Roppongi, Tokyo is an area of Japan famous for extravagant shopping and eccentric nightclubs. 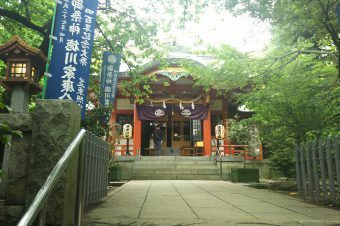 Due to Roppongi’s reputation, it is the last place in Tokyo that people would think of for visiting shrines. 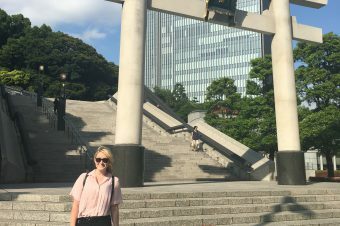 However, the shrines and temples of Japan were built hundreds of years before nightclubs and shopping malls existed, so Roppongi definitely holds some hidden gems that are worth exploring. 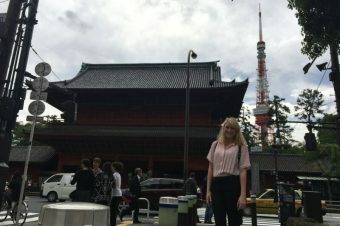 One of the most interesting shrines found in Roppongi is the Sakurada Shrine. The shrine sits right within a standard busy street and can only be recognized by the large torii gate out front. 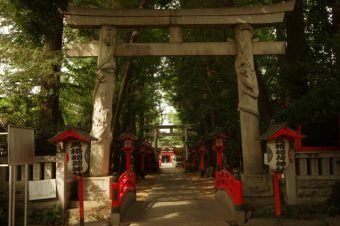 Once you pass through the torii gate, it feels as though you have been transported out of the big city of Roppongi and deep into nature. The shrine is surrounded in luscious trees and greenery and is absolutely stunning. 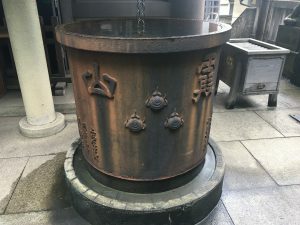 The prize possession of the Sakurada Shrine is their extremely large Ten-sui-oke, a kind of basin for saving water from rain. 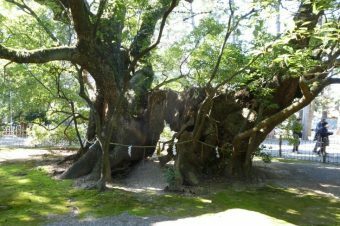 The Ten-sui-oke at this shrine has existed for over 200 years. In Japanese, “ten” means the sky or heaven, “sui” means water, and “oke” means pail or box. When we visited the Sakurada Shrine, we were taught by one of the priests that rain is a present from the kami (Shinto deities) of the sky. This is believed because the houses from this time period were only made out of wood, and therefore house fires were very common. The Japanese believed that the rain was given to them by the kami so that they had a force to fight back against fires. The Japanese believed that the only way to put out their fires is with rain that had been presented by the kami. 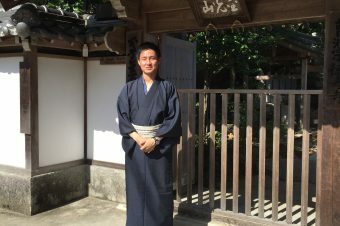 This is why “rain” at the time was referred to as “tensui” or “heaven water.” This story truly shows the spirit and culture behind Japanese religion and faith. Right by the Sakurada shrine used to lay the house of Abe Harimanokami. Abe was the father of Okitasoji, who was a member of Shinsengumi, a special police force organized by the Bakufu (military government) during Japan’s Bakumatsu period (late shogun) in 1864. The Shinsenhumi police force was active until the year 1869. 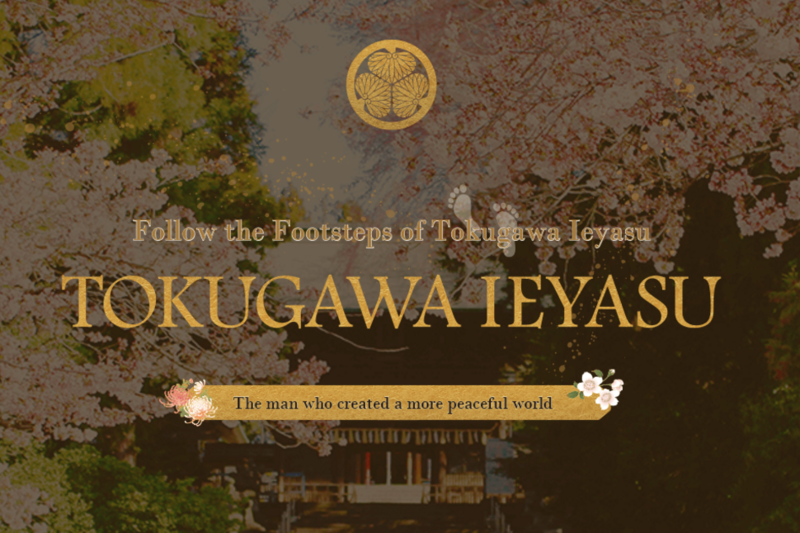 The police force was created in order to protect the Shogun representatives that resided in Kyoto. At the time, a controversial imperial edict to exclude foreign trade from Japan had been made and the Choshu Clan (a feudal domain of Japan during the Edo period, 1603–1867) had been forced from the imperial court. Abe’s son, Okitasoji, was one of the most famous officers of the Shinsengumi. This is because not only was he the captain of the first unit of the Shinsengumi, but he was also one of the best swordsmen of the entire force. Due to Okitasoji’s legend, he is very popular among young Japanese people. His face is commonly drawn into popular manga, representing his as having been extremely handsome. What is fascinating is that Okitasoji was not regarded as a good-looking man, and rather the Japanese culture adapted his looks to make his appearance drastically more appealing and heroic. The truth is, Okitasoji was heroic, and the Japanese wanted to pay tribute to his bravery by portraying him in the best light possible. Okitasoji may have been undefeatable when armed with a sword, but his body worked against him and he died of tuberculosis at the young age of 24. 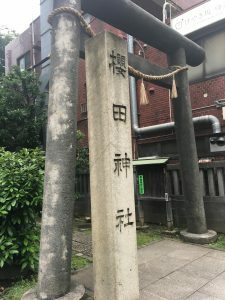 The tomb of Okitasoji is found close to Sakurada shrine and is definitely a valuable experience to visit due to Okitasoji’s impact on Japanese history and culture. 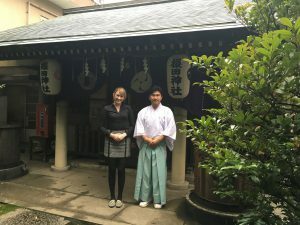 【Message from Sakuradajinjya】　The Sakurada Shrine is completely family-run by an incredibly kind group of people who are eager to share the story of their shrine. Unfortunately, none of the family members can speak English, however we still hope for foreign visitors to come by. The Sakurada Shrine is a beautiful shrine with a beautiful history worth visiting and seeing yourself. This shrine is an easy stop to make while visiting the vast shopping district of Roppongi.